Hats off to teachers…it’s time for Mid-Week Focus to feature fun and functional ACTIVITIES TO HELP KIDS COPE. …Long before I overheard a recent conversation between a third grade teacher and the school’s psychologist about the increasing anxiety that children were showing in school, I’ve continually felt K – 5 kids’ anxiety myself in classrooms everywhere I’ve taught, especially since 2001. I’ve noticed that when I’ve asked children to name some of the feelings that writing allows us to express, the first feeling that someone calls out in class is sad! The word sad is often followed by the words angry, frustrated and worried, all before someone finally mentions happy! 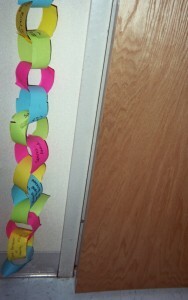 Hang a Worry Chain in a corner. Invite students to add links that express personal concerns. Teachers may be able to help kids cope by inviting them to ADD A LINK TO A WORRY CHAIN, like the one shown in my blog pic here. 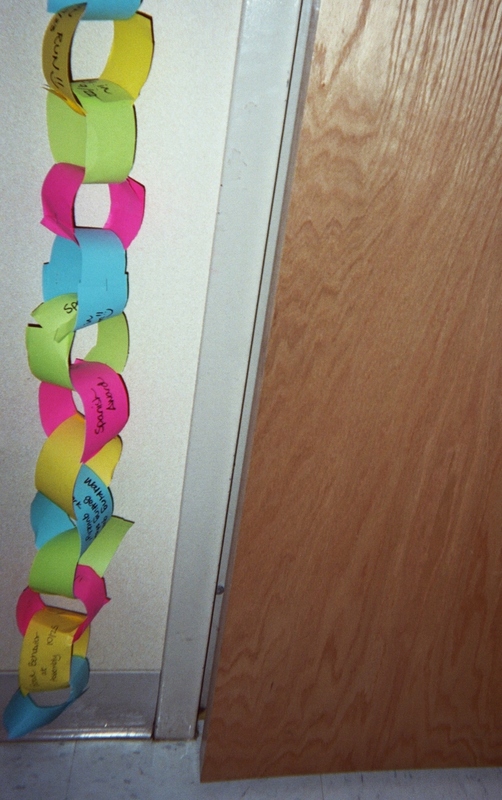 As you can see, a Worry Chain is simply a continuous chain made of strips of colored paper loops on which students have written personal feelings and concerns. Hang the Worry Chain in a relatively private corner of your classroom so that kids feel free to tape a new link to it when they want to unburden a negative feeling. When you introduce your class to the Worry Chain corner, show them that you’ve started the chain by writing a few common concerns that all children share in elementary school (you know because you’re “the teacher!”) Write one concern per link to begin the Worry Chain. Leave pre-cut strips of paper, pencils and tape nearby. Tell students that they are welcome to add links with their writing, and they may also feel free to read the writing on the other links. Worry Chains are symbols of classrooms as communities. Point this out to reinforce the sense of care for kids that you want to convey. Making a Worry Chain to help kids cope is an attention-getting way to open a discussion about managing doubts and fears in a sometimes uncertain world. Bring the class together and ask everyone to get very quiet and think of something that bothers them right now. Using age-appropriate language, you can offer words that elaborate on the concept of being “bothered” – words like worries you, concerns you, makes you feel anxious, etc. Instruct everyone to “hold that thought” and get ready to travel a world of feelings. 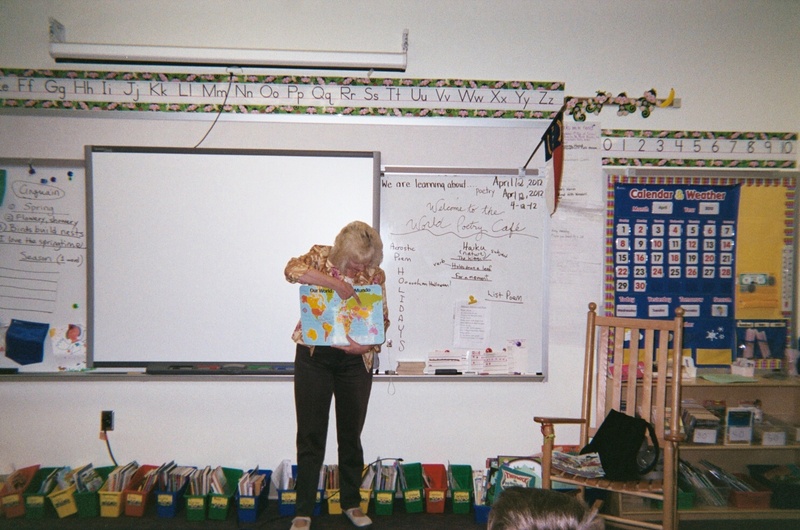 Hold up a world globe or point to a world map, like you see me doing in my blog pic here. “Do children in this country write about their feelings like we do? Yes! Tell the class that you have good news – children everywhere share the same worries, doubts and fears! Spin the globe or race your own hand “around the world” and invite kids to take turns putting a finger on any spot when the globe or your hand stops. Show the beads when you introduce this tradition as described above. Optional: Coordinate with your school’s art teacher about the possibility of making small ceramic beads that children can string together as part of the art curriculum in the year you offer this activity to students. At your convenience access more tools and tricks to help worried kids cope in related posts that I’ve published. One features activities to Re-focus Attention with Loneliness Busters! Another post offers ideas to help kids Contract to Worry Less. The most recent related post, published after the tragedy at Sandy Hook Elementary School in Connecticut (US), is titled Helping Kids Cope. Journal-keeping is also another tool to help kids cope with worries and other negative feelings. Offer this option to your class by leading a discussion about how people associate events (perhaps noted in a journal) with FEELINGS as well as ACTIVITIES. Journals may become records of events and how they made the journal-keeper feel. Students in grades 3 – 5 will understand that journals can include observations about events, places, people AND oneself. I explain to my classes that experiences often “trigger” thoughts that at first may seem unrelated but later, through journal-keeping, become understandable connections. Change seems to be the constant connection for us all in the world today. Research points to constant change as a contributor to anxiety. One thing that never changes, though, is the challenge and responsibility that we as teachers and parents must embrace – implementing creative “tools and tricks” to help kids cope. Please send comments! 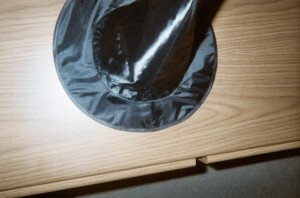 We want to add to the wealth of ideas waiting to be shared under the Magic Hat. Talk with you again soon, Monday for sure, with a new Attentionology for K – 5 Teachers. ‹ Sign On to a Road Show for Teaching! 3 Pings/Trackbacks for "Make a Worry Chain to Help Kids Cope"